This Core Set invites you to enter a completely new era of infantry battles in the Star Wars galaxy, pitting the overwhelming Separatist droid forces against the Republic’s crack armies of clone troopers and Jedi Knights. With the 39 unpainted, easily assembled miniatures you find here, you can begin building and painting a unique army of the Clone Wars’ most iconic heroes, villains, troopers, and vehicles. As you do, you’ll develop new strategies and deploy new tactics tailored to each of these faction’s unique capabilities. In addition to introducing the Galactic Republic and Separatist Alliance to the game as new factions, this Core Set contains all the cards, tools and tokens you need to begin staging your own Star Wars battles right away, making this the perfect starting point for building your Star Wars: Legion collection. Importantly, the Clone Wars Core Set is not a new edition of the game, and you don’t need the original Core Set to start playing. The Clone Wars Core Set is fully compatible with all previous Star Wars: Legion products, inviting you to play out whatever battles you can imagine across the saga. 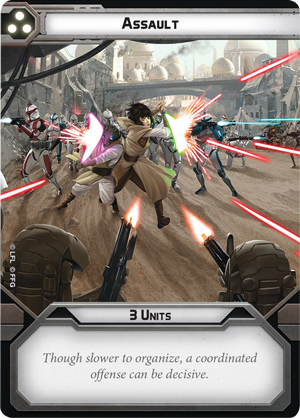 Star Wars: Legion puts you in command of your own army of units straight out of the Star Wars saga, engaging your opponent in furious firefights across a war-torn galaxy. During a game, you will strategically manoeuvre your troops through bombed-out warzones, unleash barrages of blaster fire, and engage in lethal lightsaber duels in a desperate struggle to determine the fate of the galaxy. To begin building your Separatist armies, you’ll find 18 unpainted, finely detailed B1 Battle Droid miniatures, enough for two corps units. Ready to support them on the battlefield are four Droideka miniatures representing these destructive droids in both their standard and wheel mode forms. Countering the Separatist threat to peace and democracy are the Republic’s clone troopers. Trained as soldiers from their conception and deeply loyal to the cause of the Republic, Phase I Clone Troopers join their Jedi generals in the effort to preserve peace in the galaxy. As skilled as they are in battle, though, Clone Troopers alone can’t hope to stand against the crushing weight of the Separatists’ battle droids. Thankfully, a BARC speeder can help them adapt to the environment on many planets and provide a welcome source of speed. 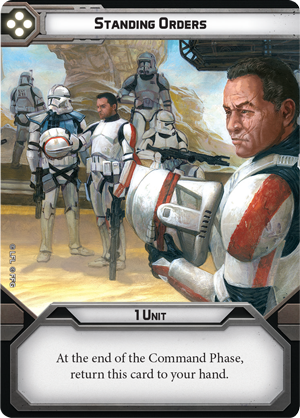 Within the Clone Wars Core Set, you’ll find 14 Phase I Clone Trooper miniatures that can be used as the first two corps units in your own Grand Army of the Republic. Joining these troops is a beautifully sculpted BARC Speeder miniature featuring several customisation options. This miniature can be assembled with or without its sidecar and, if you decide to add this feature, you’ll unlock even more customisation options, with three distinct weapon options for the gunner. Just as essential to your army are the commanders who issue orders to your troopers. Fittingly, the Galactic Republic and Separatist Alliance enter Star Wars: Legion with two of the most recognisable leaders in the galaxy leading their troops into battle. The legendary Jedi Master Obi-Wan Kenobi joins the dastardly cyborg General Grievous as their armies’ commanders, contributing both their combat prowess and their leadership skills to your battle plan. With the Force as his ally, Obi-Wan Kenobi charges into battle. As you might expect, Kenobi is deadly in melee combat with his lightsaber. But his mastery of the Soresu form of combat also gives him a superior defence, allowing him to easily deflect incoming blaster bolts. To represent Kenobi on the battlefield, the Clone Wars Core Set contains one finely detailed Obi-Wan Kenobi miniature in his ready stance, awaiting the attacks of any who would threaten the Republic. Clearly capable of causing massive damage on their own, these commanders’ influence reaches far beyond the enemies they engage in combat. They also have the vital job of issuing orders to those under their command and both have their own style of leadership. Through the three signature command cards that you’ll find for each of them, Obi-Wan Kenobi and General Grievous can exert their own influence on a battle, granting themselves and their units special abilities and setting the tone for your army’s manoeuvres. While armies of Battle Droids built in droid foundries and Clone Troopers created from the same genetic template may sound strictly uniform, there are plenty of opportunities for you to build a unique army. 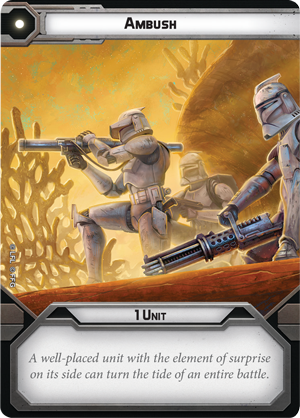 On top of choosing the troops and vehicles that round out your armies, the Clone Wars Core Set gives you the ability to tweak your individual units with a suite of 40 upgrade cards. 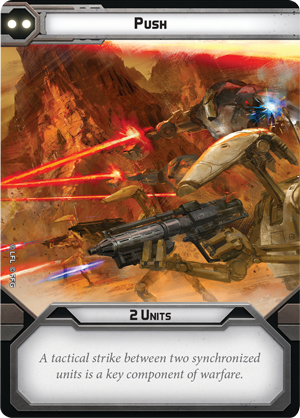 Whether you’re looking for a way to increase a unit’s firepower or to improve your lines of communication, you’ll find a mix of new and reprinted upgrade cards to build an army uniquely your own. Twelve battle cards and eight barricades help you define your battlefield and, once the battle begins, you’ll find the movement tools, four-part range ruler, and attack and defence dice you need to make moving and attacking with your troops fast and organic. Finally, this Core Set contains all the tokens you need for any situation that may arise in the heat of battle. Assemble your forces and experience the Clone Wars. The Star Wars: Legion Clone Wars Core Set (SWL44) is set to be released in the third quarter of 2019. Head to your local retailer to pre-order your copy today!